What a lovely ride up the mountain it must have been . It reminded me of my own funicular ride at Lake Como. I’m actually petrified of this perilous angle and even find it scary on some subway escalators! I didn’t find it scary, but then heights don’t seem to bother me much. I found it exciting, but I can see how it might bother some. Thanks for commenting! Call me crazy. I was in Heidelberg and remember the castle. I do not remember the funicular. I must have been one of the crazy people to hike up that hill to the castle in 1985. HaHa, I wouldn’t call you crazy, Suzanne. But perhaps very… energetic. But then, we were all a whole lot younger in 1985! I was not aware of the funicular when I was in Heidelberg long ago. Can’t remember how we got to the castle but I don’t remember climbing stairs or hiking. Such is memory. The most interesting thing about this piece is the description of the early cable train that used water for locomotion. 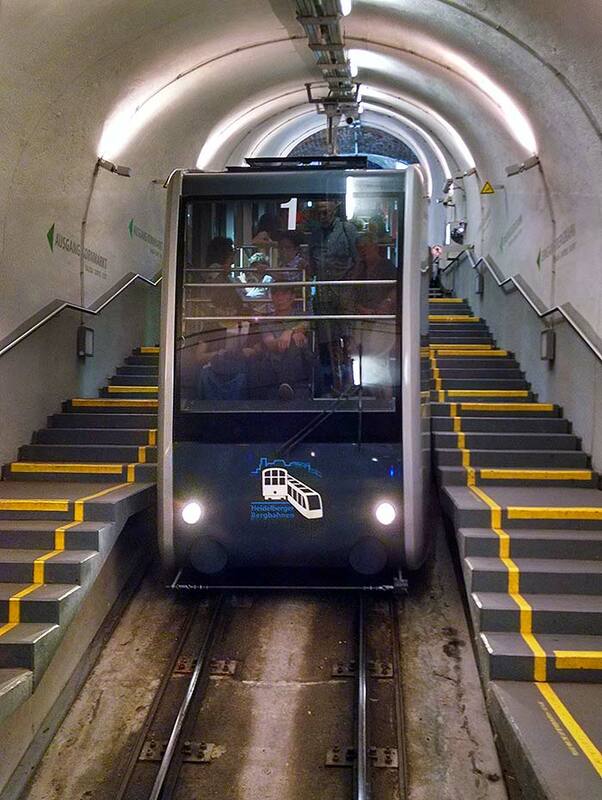 I’ve not heard of this even though I’ve ridden many funiculars in Switzerland. Very clever engineering. I can well imagine your connecting with a grandfather who walked in these places and speaks to you now. How very special. Memory is indeed a strange animal. I was also fascinated by the use of water weight to lift the lower car. Thanks for your comment, Janet.